TPC Overall Rank: #111 out of 2933 rides. In User Top 10: 65 times. User Tracker Count: 373 times. WHOOSH!!!!! i think that really does sum it up doesnt it!!! i mean the ride is short, only a few seconds, after waiting, i dont know at least a half hour, maybe 20-25 min., but more than worth it. i would wait an hour, to ride it, just plain awesome, gotta ride it, trust me on this one!!! Holy crap, this ride scared the piss out of me!!!!!! The turbo shot was scarier. I loved this ride so much!! Space Shot always has a shorter wait, and you can really feel the air up at the top. Turbo Drop is great because you wait about 20 seconds before you drop, but you get a great view 240ft up! 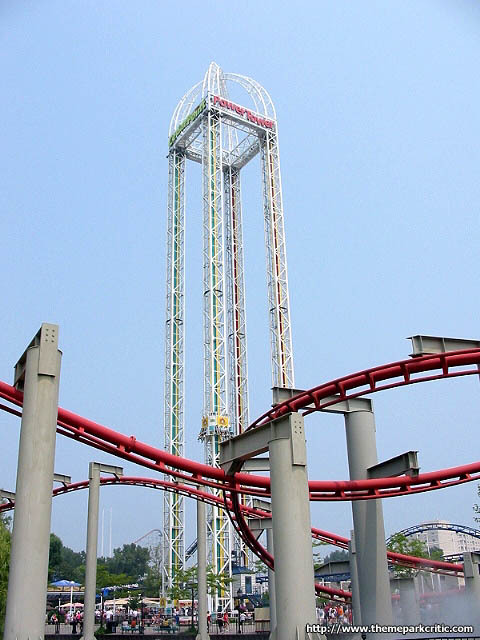 The height of this ride makes the ride. 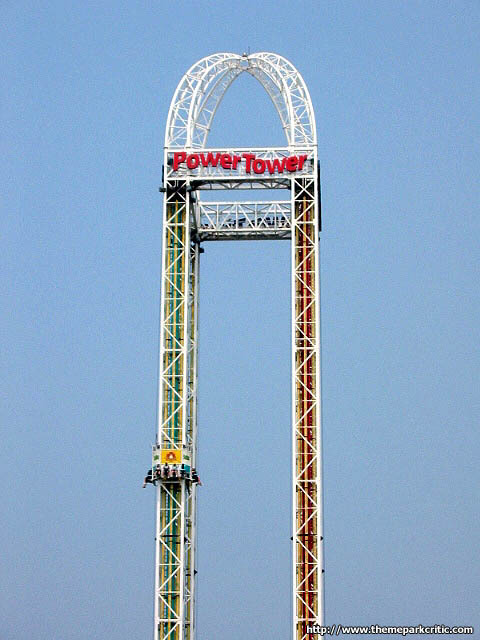 However I wish they would combine the turbo drop with the turbo shot like other s&s towers. A great space shot! If rideing the interior spikes (closest to path) I prefer being dropped. Climbing to the top of the spike and then looking up at the arch is ver intimadating! If facing the lake I prefer to be launched up- what a spectacualr view! Man it was sweet. The line was good and short when I went on at night. At night its real nices because you see all the lights. Really feels good with all the winds. Feels like something you just cannot compare to a rollar coaster! 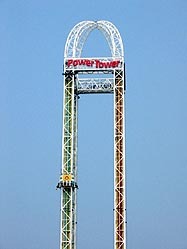 Power Tower is a vertical tower/ free fall ride. It is fast, fun, rerideable, it has a large capacity, and a long duration.